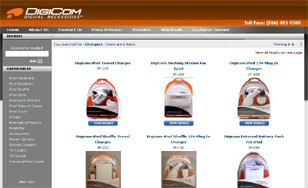 This E commerce web design is a shopping site for mobile parts. They are located locally but their website allows them to sell nationwide. With their e commerce web design the products they sell are always showcased for visitors to view. This self maintained web design can have changes made in office without the help of a programmer. Price changes, new products or any other news can be added or taken away. Future clients can view company information and employees can also be added or removed. Consumers can easily make purchases with their credit card.If your business has a product to sell and information about those products, an e commerce web design might be for you.